Did you know that you need to exercise your dog, at minimum, thirty minutes of exercise each and every day? Does your dog get thirty minutes? There are some signs when your dog isn’t getting his or her daily exercise. First, you may notice naughty doggie behaviors such as chewing, barking, whining, etc. When this happens, your dog’s energies are focusing on the undesirable-type behaviors, but only—at least in some/most cases—because he or she is bored and restless. Dogs of all breeds need some type of activity. The working breeds such as retrievers, huskies, and pointing breeds may need more exercise than others. Yes, it is up to you to get your dog some exercise, to give him or her something on which they can focus their energies. Here are a few tips to keeping your dog happy and health. Obviously, your dog is going to enjoy going on walks. Walk your dog for thirty minutes straight—more, especially if your dog needs the extra activity. 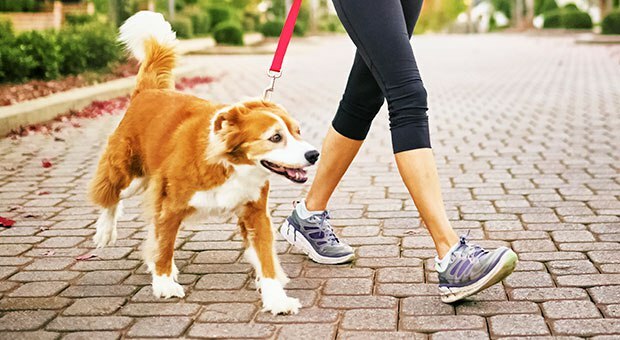 Walking is a good bonding exercise for you and your dog. It gets them outside, experiencing the sights and smells of the world. Running is also very, very good for many breeds of dogs. Sure, al dog breeds can handle the casual jog, but maybe think twice before you set out to run a marathon-distance with one of the toy breeds. If you intend to run with your dog, make sure that you break him or her into it slowly. Your dog isn’t going to tell you when it needs a break. Most likely, if you’re running then he or she will be running with you. Start with short distances, a mile or less, and then work into long distances. Humans need weeks and months to accustom their bodies to long runs, so treat your dog in the same way, and you’ll have a happy healthy dog. Retrieving is a great activity for most dogs. Certain dogs enjoy retrieving, while others don’t. It’s usually not a breed thing. A miniature Shiatzu may enjoy retrieving as much as a Labrador—you never know. Groomingdale’s does offer doggie day care, which will definitely help with your dog’s activity levels. If you need a place for your dog to spend time while you work, then call today.